Horizon: What is one Degree? As I mentioned in only my last post, in August 2010 I spent a long day helping the Horizon team with a short scene for their programme addressing the question “What is one degree?”. I have just heard that the programme is due to air tomorrow (BBC2: 9:00 p.m. Monday January 10th 2011). The final cut may or may not feature scenes at NPL, but in any case my own family will be watching Glee at that time (!) but I will catch the programme on iPlayer. If you watch this programme, please remember to keep your expectations low, and I would like to take this opportunity to apologise in advance for any crimes against science committed by the team. Well I kept my expectations low, and I think the programme exceeded them. I am not the programme’s target audience so in a sense my view counts for nothing. They certainly hit some key conceptual targets on the head. They talked about early pioneers and in particular Joule’s astonishing work, and they got the idea of temperature as a measure of the speed of molecular motion with a nice visual metaphor, but they also made some spectacular mistakes. Who is Jim Al Khalili that he things he can say that heat does not exist! And who is the editor that left that nonsense in! And who are all these physicists that still use degrees Centigrade – have they never heard of SI units? Overall I feel sure this programme will communicate a positive sense about science, and about the importance of temperature measurement, but I feel there was clearer message waiting to be communicated which just wasn’t spoken. On a personal note, I feel NPL was portrayed fairly positively, and for that I feel grateful. And relieved. This entry was posted on January 10, 2011 at 12:09 am and is filed under Personal, Simple Science, Uncategorized. You can follow any responses to this entry through the RSS 2.0 feed. You can leave a response, or trackback from your own site. The One Degree programme was to put it bluntly CRAP. Hi. Good point clearly put. Were you its target audience? Who IS the target audience for Horizon nowadays? As far I can tell, it cannot be the same as it was a few years ago and I’m afraid it seems that I’m no longer in it. The latest programme didn’t have a clear question in mind and was afraid to explain anything. When it got interesting it just past on to something else and there was lots of padding (I’m sorry, I’m not at all interested in Ben Miller’s truncated academic career and, while I love the Citroen DS, it is not what I turned on for). It’s hard to disagree with Richard and K. Lowndes. Alas! it is all par for the course nowadays. Horizon is just not what it used to be: a serious, informative, science documentary that assumed a reasonable level of intelligence in its audience. I only saw the last 10mins but the simily of comparing 1deg with 1inch in height on a standard distribution curve seemed amazingly flawed,basicaly it said how the No.of taller people would increase ,by shifting the curve to the right (analogy No.of High temps increasing) neglecting to see that the No.of small people would decrease to the same extent (Less cool extremes).This certainly doesn’t seemto be the case in the last three years in this country. The point about small shifts in the mean of a distribution bringing about significant changes in the frequency of extreme events is a good point. Unfortunately, there is no reason to think that the extreme events in a weather distribution are governed by normal statistics – typical these only work well close to the mean. Additionally the timescale for averaging is at least 30 years!. And that’s one of the key issues about the issue of climate change – as individuals we basically have no sense of climate – our individual lives are too short and our memories too weak to clearly recall many decades past. We have to rely on the instrumental record – and then wait decades to see how the averages numbers are evolving – it doesn’t play in a media world which demands instant comment and analysis on every extreme weather event. Ben Miller is ace. I enjoy all science related programmes, especially when people like Miller attempt to explain science in more everyday terms. Haven’t enjoyed a programme as much since Aristotle’s lagoon and stargazing. Well done the BBC. I’m off to melt my butter on some toast. You are right. He is personally engaging and did his job well. I did feel he was expressing a little bit of genuine regret that he only had the one degree. What? Only one degree? How does he manage! Personally I would swap his income for my D.Phil. at the drop of a hat, but he couldn’t have my MBE for all the tea in China! You academics in your ivory towers! Down on the ground we need Ben Miller to explain what you’re up to, which he did beautifully. He is not only one of my favourite people but it turns out he drives my favourite car too! I was fascinated by the science, tho’ I do have a question – was that super cooled helium actually passing through that dipper thing? And if so what was it made of and why wasn’t it passing through its other container? Also he seemed to miss out the whole side of it to do with how we perceive heat. But it was wonderful and interesting tele and I learned a thing or two. 1. I am not an academic. I am currently building the most accurate thermometer ever made. I also teach this subject in Protons for Breakfast and frankly, I think I make a better job of it. 3.The helium was cooled to below 2.17 degrees about absolute zero at which point it enters the superfluid state. The bottom of the container is made out of jeweller’s rouge – a very grade of polishing powder. When the powder is packed together the gaps between the particles are nanometres in size – just a few atoms wide. In the superfluid state helium will flow through these tiny gaps. Glass doesn’t have these tiny holes in. Thank you for 3. (I know what rouge is – I am a jeweller!) He could have explained that better. To be honest I could have coped with a bit more scientific explanation, like you just gave, in the programme. But it was great to see that superfluid bit. Physics is fscinating! I am sorry to say it but I thought the Horizon programme “What is one degree?” was extremely disappointing. Dumming down science so much will, I believe, teach no one anything. In essence the programme came to the obvious conclusion straight away, i.e. one degree of anything is anything you want it to be, and then moved on to interesting visuals, like the cooling of liquid helium to near absolute zero. The reason Ben Miller was asked the question was in relation to climate change, and the answer to this was not provided (naturally so, as it would take more than one programme). I remember fondly the days when Horizon was a detective story, as described on the Wikipedia entry. Where the viewer was provided an initial problem and the solution was explained over the subsequent hour. They were masterful programmes, dealing with all levels of science, no matter how complex, and expecting an interested viewer to keep up. The programme on “What is one degree?” was clearly aimed a school child’s level, who would cover the subject in O-level physics (showing my age here). Please come back to the old style. Bring back John Shrapnel. Talk us through difficult and complex scientific problems, and wet our appetites for science. I watched the programme last night and thought it was a mixture of good and bad really. -The muddled story/editing where first he tried to make a thermometer in order to define ‘one degree’ but then basically gave up having been told his melting butter wasn’t a very good standard and then went off to find out what temperature/energy was, look at some cold things/find out about absolute zero, look at some hot things, do a bit of weather forecasting. -Although they had all the important parts there I don’t think they ever got round to defining 1 degree C / Kelvin. Interesting responses from the Ivory Tower dwellers; please get your heads out of your own a***s. Science is fascinating and the really best dtective novels leave you wanting more. I didn’t even watch the program but was fascinated enough by the subject matter to delve into it further. If that was the aim of the program them the BBC succeeded. If the aim was present D.Phil level thesis finding though , I’m sure for some it failed. For me it succeeded. My teenage son and daughter always enjoy Horizon and for our dwindling scientic influence in the UK the program should be welcomed and supported not disdained. Whilst they are closing down scientific institutions any efforts to popularize science should be supported and not maligned. I was on the BBC iPlayer website and found a link to this programme which I remembered watching, following a few links I am compelled to make a posting, in no proximity to an ivory tower, that ‘What is One Degree’ was complete and utter nonsense. It was factually incorrect and in no way interesting or inspiring. The professor towards the end who completely disagreed with the 2nd LAW of thermodynamics regarding the conservation of energy was the final insult. This could have been a brilliant programme but was dumbed down to idiot level. If you are an adult, and were convinced by any of this, then your science teachers at school should be right, royally slapped. Rob. I sympathise. My colleague and I spent hours with the director and his assistant, and while they were very well meaning, I never got any sense that they had even the slightest clue about what ‘one degree’ actually means. A few people have commented here that they enjoyed the programme: great. But I feel, and suspect you would sympathise, that the programme was spectacularly unambitious and I feel strongly that Horizon ought to be ambitious. For example, the team were just 50 metres away from the most accurate thermometer human beings have ever made and (Ben Miller excepted) they didn’t even bother to walk down the corridor to visit it. Ce La vie. “Well I kept my expectations low, and I think the programme exceeded them.” I reckon that comment could be seen as a Freudian slip. Your conscious mind wanted to say that the program was better than you feared it might be; but you expressed it in such a way that also be construed as displaying your true feelings that it exceeded your expectations by being even worse than you expected. I have written an article which is highly critical of the Horizon program and BBC science in general. Interesting ‘analysis’. Its possible. The programme was better than I feared, but it was, frankly, very poor. Regarding other items on your linked page. I sympathise very much with your criticism of Horizon. The team I met from the director down just knew nothing about physics. I can’t quite follow your link to relativity but in general regarding your regular temperature statements, they are poorly phrased. For example ‘The temperature of a body, is a measure of the amount of heat it contains’ is just wrong. If the body was twice as big, the amount of heat would be doubled, but its temperature would be the same. Temperature is an intensive quantity – colloquially a measure of a ‘quality’ rather than an amount. In reality temperature is a measure of the average kinetic energy of particles within a substance. Regarding global warming, the increase in radiation from the Earth’s surface is very much considered. The point is that the carbon dioxide impedes the loss of infrared radiation from the Earth’s surface but does not impede sunlight reaching the Earth’s surface. It is this that drives the temperature increase. I agree that what I wrote about global warming was stupid, so I deleted it. Since what I actually wrote was: “The temperature of a body, is a measure of the amount of heat it contains, in the sense that a 1 kg lump of iron at 300 K contains twice as much heat energy as a 1 kg lump of iron at 150 K. However a 1 kg bag of water at 300 K most certainly does not contain the same amount of heat energy as a 1 kg lump of iron at 300 K ……” I cannot think anybody could possibly be confused in the way you suggest. It seems that because my article criticised some physicists, and some aspects of modern physics, you felt a need to find fault with my article, even if none existed. This is what I mean by the religious nature of modern physics, physicists will not even criticise a colleague for talking nonsense about time travel, but if somebody in any way criticises their beliefs, they will concoct any excuse to attack them. Since you are an expert on temperature, perhaps you could enlighten me by saying whether there is a simple mathematical relationship to explain why total radiation from a blackbody is equal to the fourth power of T: eg. Double T, results in twice as many photons emitted at twice the average energy. I had no intention to attack. But the point you made about temperature – something close to my heart – was just wrong. I understood your point about iron specifiically but even saying that a lump of iron at 300 K contains twice as much energy as a lump of iron at 150 K is also wrong. This assumes that the heat capacity of an object is constant, and it is not. Very far from it in fact. These problems are real profound problems in the definition of temperature and the historical evolution of the concept of temperature and I apologise if I came over overly negative. Mea culpa. Regarding the existence of quarks, your comment seemed to imply that you were not aware of the experimental evidence for the internal structure of the proton. I criticise physics that I think is wrong, and I want my ideas criticised, but not by snipping sentences in half to misrepresent what I said. Sometimes people get physics wrong, like the BBC did a program about the tides in which they had the moon orbiting in the opposite direction to the earth’s rotation. That was a blatant error, and would imply high tide should be 50 mins earlier each day rather than later, and even early civilisations would have known it to be wrong. But what I wrote was only wrong in the sense that SHC is wrong. I wondered if I could amend it to something like: “The temperature of a body, is a measure of the amount of heat it contains, in the sense that a 1 kg lump of iron at 300 K contains twice as much heat energy as a 1 kg lump of iron at 150 K (to within about 10%)” do you know what the accuracy is? The person from Britastro who complained about the gross error in the moon program, also complained about a number of other less blatant things. So I am wondering whether perhaps the BBC actually deliberately avoid anything at all complex, to avoid criticism. Like myself you criticise the BBC for merely stating the obvious, but you also criticise my attempts to go a bit deeper. So maybe making a documentary about temperature is not as easy as I thought. I would be interested to see your answer to the question “What is one degree?”, is this a subject that you lecture the general public on? Hi. I am not sure what you consider ‘sniping’. The issue about heat capacity and the distinction between temperature and heat is quite a fundamental point. There are >no< solid or liquid materials in which the heat capacity is a constant independent of temperature. Noble gases are the closest approximation we have. I don't know the extent of the change for iron, but in my book there is an illustration of the heat capacity of gold silver and copper (FIgure 7.19). Here is a link to the Chapter 7 figures. Looking up the Debye Temperature of Iron, your statement might be true at the level of 10% or 20%. I worked with the Horizon team extensively on the documentary, and they basically just ignored everything I suggested. It is not an easy question, but asking comedians rather than experts the answer is not the best way to get a good answer. I said ‘snipping’ as with scissors; but anyway thanks for the correction, I have amended my page. There is probably much else that could be improved; but I had best try to get to grips with the maths of Planck’s Law, then I should be able to judge whether my model of colliding gas molecules is tenable. It seems the peak power emission comes with photons that have an energy 4.97 times the average kinetic energy of the gas molecules, which is perhaps surprisingly high. It is a pity they would not listen to you, as I am sure the program would have been much better if they had. I guess the BBC wanted a celebrity presenter, but really that is what made him unsuitable for the task, as he would have been busy with other work, and expensive to employ. 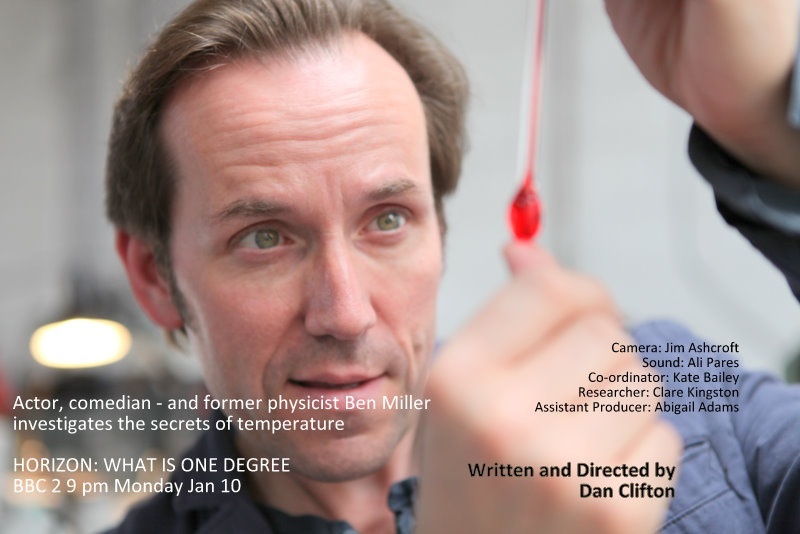 Somebody with Miller’s intellect and presenting skills, might have been alright if he had been able to spend four times as long working on the show; as you said, he did at least take a look at your highly accurate thermometer. I replied to your comment on quarks on my own website.